"Before the crisis: Vote for your rights. United Left, your voice in Europe." March 26, 2014 – Links International Journal of Socialist Renewal -- As the May 25 European elections approach, a question that concerns left and progressive people in the Spanish state is just how many left alternatives will end up running against the “parties of government”—the ruling conservative People’s Party (PP) and the opposition Spanish Socialist Workers Party (PSOE). July 7, 2013 – Links International Journal of Socialist Renewal -- The mainstream media were taken aback: why was the first congress of the Galician left nationalist organisation Anova — the key component along with the United Left (EU in Galicia, IU nationally) in Galicia of the hugely successful Galician Left Alternative (AGE) — so heated and acrimonious, at times reaching the point of “shambles” (the term of the chairperson)? How come the 16-month-old Anova — vital to AGE winning 14% of the vote in the October 2012 Galician regional elections and now at the point of overtaking the Galician affiliate of the social-democratic Spanish Socialist Workers Party (PSOE) in the polls — was having a congress marked by dissent from the rulings of the presiding committee, fierce lobbying of delegates and in-the-corridors distribution of four how-to-vote cards for different tickets for the national coordinating committee? It was left to Xosé Manuel Beiras, historic leader of Galician left nationalism and Anova’s unanimously re-elected spokesperson, to help the media — and some shell-shocked delegates — grasp what had happened in the Congress Centre of Santiago de Compostela, capital of Galicia, on June 8-9, 2013. In June 2013, the United Left trailed just 4.7% percentage points behind the PSOE (16.8% to 21.5%). Click on graph for larger size. June 21, 2013 -- Links International Journal of Socialist Renewal -- The latest opinion polls in the Spanish state have been stirring waves of concern in the ruling elites, of hope on the left and storms of comment in the media. Nationally, they show the radical federation United Left (IU) within reach of closing the gap on the social-democratic Spanish Socialist Workers Party (PSOE). In the June Metroscopia poll IU trailed just 4.7% percentage points behind the PSOE (16.8% to 21.5%). For more on the Galician Left Alternative, click HERE. For more on Spain, click HERE. Xosé-Manuel Beiras, 76, has been a prominent figure nationalist left politics in Galicia since the 1960s. In 1963 he helped found the Galician Socialist Party (PSG, Partido Socialista Galego), illegal under the Franco dictatorship, and later became its international secretary and then general secretary (1971-77). In 1982 Beiras participated in the founding of the Galician Nationalist Bloc (BNG, Bloco Nacionalista Galego), entering its leadership. In 1985 he was elected as a BNG candidate to the 75-seat Galician parliament, and was re-elected in 1989, becoming the BNG’s parliamentary spokesperson. Upon further re-election in 1993 Beiras was also elected as the BNG’s national spokesperson at its seventh national assembly. November 5, 2012 – Links International Journal of Socialist Renewal -- On the morning of October 22, the day after elections to the parliaments of the Basque and Galician autonomous communities of the Spanish state, the TV and radio political pundits were struggling to be wise. Their powers of analysis were not tested so much by the rise of EH Bildu, the Basque left-nationalist coalition—the polls had predicted its vote of 25%. 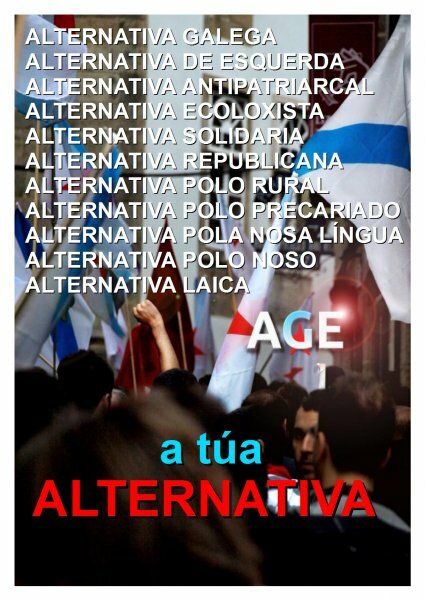 The disorienting new phenomenon was result for the new Galician Left Alternative (Alternativa Galega de Esquerda, AGE). Just six weeks old and already widely dubbed the “Galician SYRIZA”, AGE won 14% of the vote and nine seats in the 75-seat parliament. The average of poll predictions for AGE before the election was three to four seats and 6 to 7 per cent of the vote. Spain: As two-party system breaks down, what prospects for a ‘Spanish SYRIZA’? Demonstrators march to the Spanish parliament against austerity measures announced by the government in Madrid, September 26, 2012. October 28, 2012 – Links International Journal of Socialist Renewal -- The economic, social and territorial crisis in the Spanish state is morphing into a crisis of the two-party system that has provided Popular Party (PP) or Spanish Socialist Workers Party (PSOE) administrations for the last 30 years. Basque, Catalan and Galician nationalist forces (left and right), and the United Left (IU) and Union, Progress and Democracy (UPyD) parties are gaining support. However, only a brave gambler would put serious money on the future evolution of this crisis. While the two-party set-up has been severely weakened, a replacement party with enough popular support to impose a different solution has yet to emerge.